Arsenal manager Unai Emery has reportedly not given up on the prospect of keeping Aaron Ramsey despite the midfielder's recent contract breakdown with the club. Ramsey presently has six months remaining on his existing contract and this has linked him with a number of European clubs including Juventus, who have proposed a swap deal involving Sami Khedira. 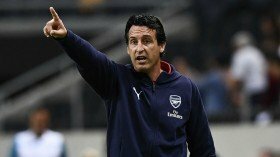 However, according to Evening Standard, Emery is not keen on acquiring the signature of Khedira during mid-season and he would rather prefer the club acting on the contract of Ramsey. Still, the Spaniard does not hold the powers to influence the club's decision given Raul Sanllehi, Vinai Venkatesham and Sven Mislintat are now regarded as the key figures behind the transfer proceedings. Arsenal are currently fifth in the league standings with a three-point gap to fourth-placed Chelsea. They are scheduled to face Blackpool in the FA Cup third round this evening.